Discussion in 'New Player Questions' started by tr1age, Dec 17, 2016. UOAlive now has a fully functioning High Seas Content! I think you will all really love it! 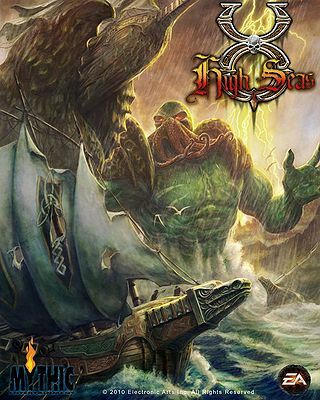 Ultima Online: High Seas is the most recent expansion (aka "booster") and launched on October 12, 2010 with Publish 68. It was first announced during a UO Town Hall Meeting held on August 28, 2010 at EA Mythic/Bioware's division headquarters in Fairfax, Virginia. It was introduced with the title Adventures on the High Seas but later trimmed to just "High Seas". It was formally announced as a "booster" as opposed to a full-fledged expansion and debuted with a retail price of $14.99 USD. On September 28, 2010 the release date was announced as October 12, 2010 and the High Seas Test shard opened for testers the next day til October 7, 2010. During the first public demonstration, an NPC orc ship was attacked but the orc crew killed the character of the lead engineer Derek Brinkmann. Ammunition crafted by Blacksmithing, and other supplies/ingredients crafted with Tinkering, Alchemy, Tailoring, andCooking. A floating, dock-style town at sea on both Felucca and Trammel facets. Located at 62o 24'S, 132o 54'W, which is roughly south of Moonglow, north of Fire Isle and west of Skara Brae. Higher levels of fishing will now increase chances of catching Uncommon and Enchanted fish. These increments occur at 60, 90, and 120. Only Legendary fishers can catch Legendary fish. Can we expect to be updated to the recent Rising Tides, patch #104? Forgive me and feel free to delete my post if this is an inappropriate question. We shall see how development goes as it has to be ported over first. Obviously we would love to.